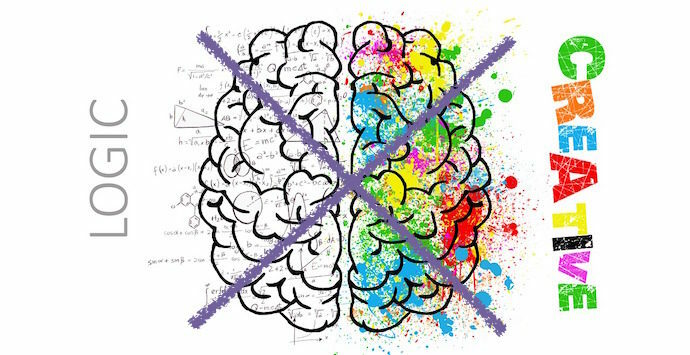 You still hear it too often: ” The right side of your brain is responsible for creativity and the left side for logic”. This belief also claims that, depending on the person, one side is more dominant than the other. Although it all sounds catchy and “sells” easily by speakers and corporate trainers, neuroscience proves this is a myth. What neuroscience data tell us? Yes, there are specialized areas in the left and right hemispheres of the brain (especially related to vision and movement). However, tons of neuroscience research, including my own, has proven time after time that creative and analytical thinking are not strictly lateralized. Interesting as well is that your brain constantly communicates to both sides through a brain structure called corpus callosum. In addition, you can apply both brain functions when needed. Otherwise you wouldn’t be able to navigate this complex world, solve problems or come up with new ideas. Although you might prefer analytical tasks over creative ones, you do have the ability to use both skills. Crucial is that you have the mental flexibility and reflective skills to adapt your processing strategies to face new and unexpected situations.